They are commonly found in the deciduous forests in between the Minnesota, Rhode Island, and Ontario and south to Kentucky, and are easily recognizable by their large, white, overlapping mandibles. The imago (adult) is 12–14 mm (1/2-5/8") in length, with long legs. The large white mandibles, give these attractive insects a ferocious appearance. Although they are strong enough to subdue their prey, they do not bite humans unless handled. Both the common name and the species name refer to the number of small white spots on the beetle's metallic-green to metallic-blue elytra, usually numbering six. This is not always true, however, as some individuals have fewer spots, or none at all. 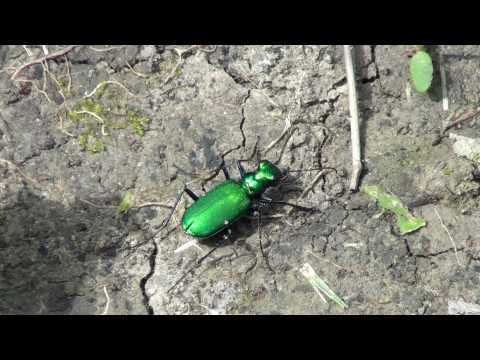 Six-spotted Tiger Beetles live in woody places, and they like shady openings such as dirt paths and fallen logs to hunt caterpillars, ants, spiders, and many other kinds of arthropods. This species is not gregarious, but sometimes many beetles may be seen in one fallen log. The females lay eggs in sandy patches, and the larvae burrow into the ground when they hatch. Here they lie in wait until small arthropods walk by, where then the larvae pounce much like jack in the boxes. The beetles stay in larvae form for about one year before pupating. The beetle has a total lifespan of just under 5 years. I found this six-spotted tiger beetle on the driveway at my babysitter's house after school today. My brother and my friend's brother were able to catch it so that I could get a closer look. It was a beautiful, shiny blue-green colour. After we snapped a few photos we let the beetle go. It was very fast for a little bug about 2 cm long! Welcome to Project Noah, 4D4Gprojectnoah. This is a gorgeous beetle, but since there is not nest, hive, bower or web in these images, it doesn't belong in the Animal Architecture mission. Please remove it from this mission soon, but keep your camera shutter ready for any nests or hives you do see!